I'm awfully glad I didn't put this off another year. What frugal investment have you hesitated making? More @ Frugal Hacks. You have a strawberry patch?! Awesome! I saw a thing in a magazine that inspired me to try to make my own jelly or jam. I'm going to start with an apple jelly recipe since I just need to use juice and it seems easiest for a beginner. It might flop. But, it might be really awesome and a way to save money and enjoy jam without lots of preservatives or additives. Best wishes for a season full of fresh strawberries, pies, jams, and much more! Such a sweet photo...she's grown up so much! I would have put out the baby crabapple branch a neighbor rooted and offered 4 years ago. At the time I thought "It will take forever for that tree to look like anything, and besides, we won't be in this house in 3 years". HA! the Neighbor has moved, I'm still here, and the young crabapple trees in her back yard are loaded with blooms and taller than me now! CONGRATS on that strawberry, MEREDITH! Now that we've gotten some good warm weather, putting the lawn furniture out is FUN! Trying to get motivated for 'the' yard sale! I'm surprised that you are just now getting your first berry. I live farther north and we have berries for awhile now. I spent the better part of last week with my grnadchildren near Nashville. 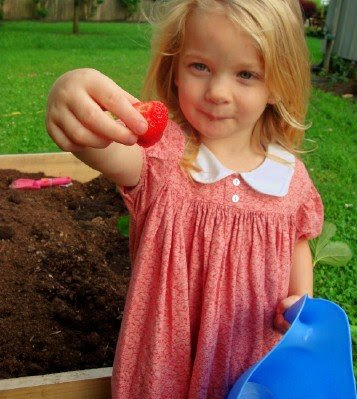 The youngest is two, and she loved checking the berries each day to see if any berries were "quite ready". On friday, she and Grandpa picked enough for all seven of us to have berries for desert that evening! Are yours established plants? Mine are newly planted, and from what I've read, won't produce that many berries until next year. My daughter's raised beds were planted last year, as were mine. I am not getting many berries, just some to eat each day. Congrats on the strawberry! We have a small strawberry patch,this is our second year for it. I'm anxious to see how it turns out,the boys ran over it with the lawn mower last season and I thought for there would be nothing there this season but to our surprise there were a few,so we shall see how it goes. My strawberries were a bust both times I've tried. Each time a bird or a rodent got to the berry before I did. It's a shame too because I don't like store-bought strawberries. We will have blackberries though, I'm hoping that I get to them before the wildlife! My husband put off getting bees for a long time, but he finally did it last year. He really loves keeping bees! I want you to know that I just, today, bought some strawberry plants for my garden after reading this post this morning! I was going to wait until next year actually but needed something else at the farm market and they caught my eye and I thought "Why wait!" Hasn't the weather here been fabulous. I've worked outside for days and wish it would stay like this forever. Perfect weather for gardening!!!! A little sugar would sweeten that strawberry right up...it's already sweeter because it came from your own garden. Are these from the plants I gave you, or did you get some more? Most of ours have been pretty sweet. Her dress goes perfectly with the strawberry! paul just brought our first one in too - not always the tastiest! our strawberries are GOING WILD! wish we could share a pie together!